Four contributions show the book's strength to engage in cross-talk rather than forwarding a singular solution. The first two chapters, "Our Trojan Horse: Outcomes Assessment and the Resurrection of Competency-Based Education" by Chris Gallagher and "Confessions of an Assessment Fellow" by Deborah Mutnick both traced the historical antecedents of austerity in current U.S. higher education. While they agreed that policy has changed to reward outcomes rather than inputs, and that this may actually decrease opportunity for education for those most disenfranchised in our society, they arrived at very different answers to the question Gallagher used as the subtitle in his closing section, "What to Do?" Gallagher's chapter further developed his (2012) argument in College English, that the field of composition compromised itself in taking up the cause and administration of outcomes assessments. He (2016) suggested, "our tacit acknowledgement that results are all that really matter in education... has opened the door to CBE [content-based education, for a scholarly description], which, in its worst forms, disregards the educational experiences of teachers and students altogether" (p. 23). Citing a specific instance involving an assessment report using an eportfolio, Gallagher concretely summed up, "This is what writing looks like under CBE: a highly instrumentalist means of conveying information for the purpose of evaluation. Instructors don't so much teach writing as they facilitate the completion of tasks that happen to require writing" (p. 30). Conversely, Mutnick's stance was one she avowed "was not then—nor… now—hostile to the idea that better assessment could improve teaching and learning" (p. 38). She provided a view from her own personal complicity in promoting "assessment fellows" at her university while still being critical of how that advocacy has panned out. Mutnick traced many of the same problems and history as Gallagher—the heavy hand of accreditors and federal programs, the influence of private corporations and their profit motive, and the social norms embedded in outcomes. Yet, unlike Gallagher, Mutnick focused on these as problems to be addressed through ongoing work. In her words, "simply refusing to participate within one's own institution strikes me as pointless if the result is to shift the burden of responsibility to other colleagues or jeopardize accreditation" (p. 46). In this way, her article worked to lead the call to "reclaim assessment and perform it on our own terms" (p. 40). Another pair showcasing the depth and range of the works collected and curated by Nancy Welch and Tony Scott closed out the second section and opened the third section, respectively. Nancy Welch's "First-Year Writing and the Angels of Austerity: A Re-Domesticated Drama" was a fierce socialist feminist critique of administrative action while Jeanne Gunner's "What Happens When Ideological Narratives Lose Their Force?" took a Latourian approach to a situation in which "critique becomes gestural, an epideictic rhetoric that does not materially move" (p. 153). As with Gallagher and Mutnick, we have two very experienced compositionists who have served in important administrative capacities. As such, we dismiss their insights at our peril. 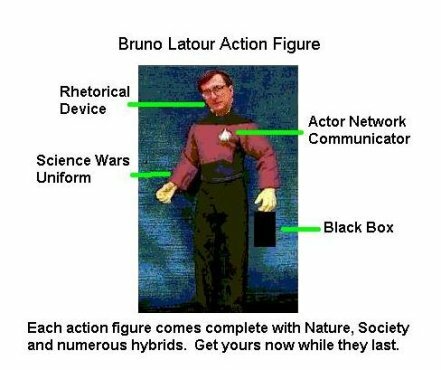 A "Bruno Latour Action Figure," including his rhetorical device, his Science Wars Uniform, his Actor Network Communicator, and his Black Box. The text reads, "Each action figure comes complete with Nature, Society, and numerous hybrids. Get yours now while they last." In other words, as Welch argued, administrators are not really persuadable since they are often directed to view composition not as a social good, but as a function of the more home-bound private sphere. The teaching of writing is best left as an "up-to-the-individual, leave-it-to-the-family responsibility" (p. 135). All this serves to unload the real labor costs on others so, under neoliberal logic, literacies can be appropriated after the labor required to produce them has already taken place. In response to past concessions to accumulate cultural capital, Gunner teased out how "consent can take a creatively disruptive form of complicity, and indirectly consenting to comply with an austerity agenda might open up space for change" (p. 154). She went on to show how displacing ideological critique from the center of composition and rhetoric is already underway through such works as Sid Dobrin's (2011) Postcomposition, Jeff Rice's (2007) The Rhetoric of Cool, and object-oriented studies. These works and others, in Gunner's estimation, hold power because of their distributed nature where actions arise immanently rather that from a central command and control (and critique) apparatus. Following this with examples of guerilla academic actions, she suggested that these efforts might "include and revise ideological critique, lessening the risk of inducing a kind of closed and unresolvable mirror stage, in which the oppressor we encounter leads us to construct ourselves as a totalized body of resistance" (p. 159). Through such counterposing perspectives, Nancy Welch and Tony Scott have presented a remarkable volume that raises many important questions through its inclusiveness and coverage of different perspectives. I especially like that they included Gunner's admiration of Latourian methods and admission that critique might just play further into neoliberal hands with its repeated gestures. The collection could certainly have taken up this debate up to a greater degree, but perhaps that would shift the focus on local literacy sites and is therefore work best left to another collection.